Lawan Taha Hama Ali at his first St. Louis Symphony Youth Orchestra rehearsal. Photo courtesy St. Louis Symphony Orchestra. American Voices has been conducting cross-cultural engagement with musicians and audiences in over 140 nations worldwide since 1993. A tenant in the Arts and Education Council’s incubator, the Centene Center for the Arts, American Voices was founded with a focus on bringing American music and culture to the recently independent nations of Central and Eastern Europe. They have since expanded to support youth through cultural and educational programs in nations emerging from conflict or isolation. One such program is the Youth Excellence on Stage (YES) Academy, which connects and inspires youth in areas of the world that lack opportunities for cultural exchange and dialogue with the United States. 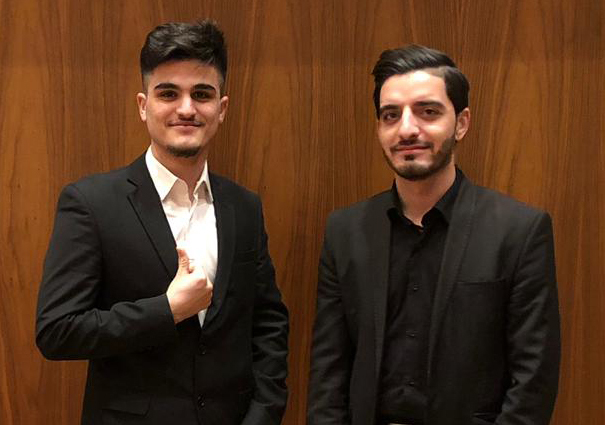 Diyar Jamal, a 21-year-old double bassist from Erbil, and Lawan Taha Hama Ali, a 23-yearold violinist from Sulaymaniyah in the Kurdistan region of Iraq both participatedin YES Academy in their home cities. Their participation in YES Academy opened the door to join the St. Louis Symphony Youth Orchestra through a collaboration with American Voices and Saint Louis University. St. Louis Symphony Orchestra, an Arts and Education Council grantee, American Voices and Saint Louis University provide housing for Jamal and Ali as they study in the United States and perform with the SLSYO. Both Jamal and Ali hope to return home to teach and play in an orchestra. Until then, they will be learning all they can in St. Louis. “Whether I am at Powell Hall and rehearsing with all of those young musicians, or in class at Saint Louis University, or spending time with American Voices members, I am being encouraged to follow my dreams and work hard to achieve them,” Jamal said. The St. Louis Symphony Youth Orchestra performs March 23 at Powell Hall. Tickets (free, $1 service charge) available here.